Remove the front seat cushion outer trim panel. Refer to Front Seat Cushion Outer Trim Panel Replacement. 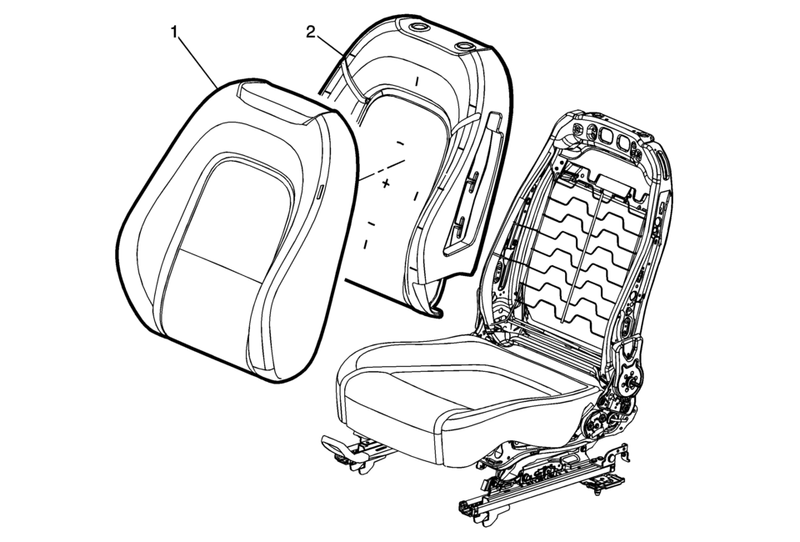 Disengage the j-channel retainers and tabs at the bottom of the seat back cover from the seat back cushion frame. Disconnect the electrical connector that is attached to the seat back cushion, if equipped. Remove the seat back cushion cover and pad from the seat cushion frame as an assembly. Pull the cushion cover assembly off of the pad. Seat back cover can be damaged upon reinstalling cover to seat back pad. When reinstalling the seat cushion cover to the seat pad, start in upper outboard corner and install outboard side of the cover. Then start at the upper inboard corner and install inboard side of cover.